Made of Genuine Full Grain leather Or You get a refund , One year quality Guarantee!!! Dimension: L 4" * H 5.7"
This Passport holder is made of Top Layer Leather and hand-made by professional artisans. 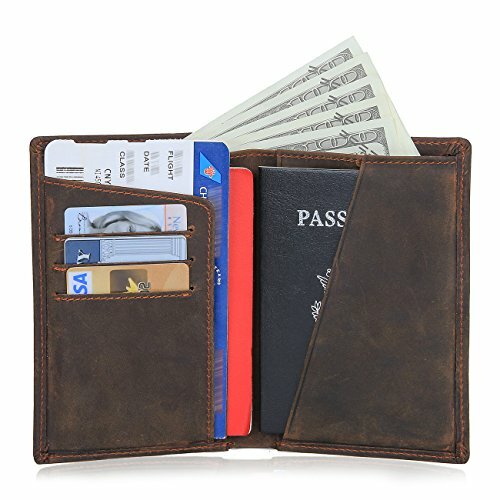 100% FULL GRAIN LEATHER - Crafted of high quality Geniune Top Cowhide Leather for a vintage look.It has a smooth soft leather feel and rugged vintage style in your hands. RFID BLOCKING - Passport cover with inside RFID blocking shield material helps prevent personal account information disclosure. Prevent your credit card, debit card and passport chip information from being stolen by RFID scanners. 1 Year Quality Guarantee!!! Please note that due to the nature of the leather there may be imperfections such as wrinkles, discoloration and markings which should be considered part of the character. Great gift for men and women Traveling! Perfect gift for Birthday Anniversaries or Christmas.